Dry land covered with grass, herbs and trees and the seas. Day 3 of Creation and Earth is more and more readied to be the home for humans. Dry land, grass, trees, seas. Day 3 of Creation and our Planet Earth is looking more and more like home for humankind. Dry land, seas, shorelines, beaches, grass, trees, fruit. Sounds like paradise. That’s what God created on Day 3 of Creation. A lush, welcoming environment that includes every conceivable need for humankind. Ever wondered why we have such richness on Earth? Our environment with its self-sustainability, viability, and practicality defy superlatives. If we take the time to analyze it, each very succinct daily description covers vast concepts. Gen. 1.2 told us the Earth was covered with water… was it salty or fresh? Who knows, but in the 21st century, we have both salt seas (96.5% of water) and freshwater (3.5%) tables each with their separate and specific environments. What lives in the sea cannot live in fresh water and vice versa, save a few species which have special systems to handle salt and fresh environs. Not only is there no consensus as to where the billions of bathtubs of water came from but no one ever broaches the question of how and why such opposite systems co-habit in total symbioses. As discussed in Inventory of the Universe the seas play an important role in climate control, reduce or increase their size by any significant percentage and the climatology is upset, not allowing for life on our planet. We are going to see they play another role. Oceans are natural geographic boundaries. 9 And God said, Let the waters under the heaven be gathered together unto one place, and let the dry (H3004) land appear: and it was so. The amassing and concentration of the water caused dry land to appear. In English, the KJV uses 2 words to express what appeared: dry and land two different concepts. 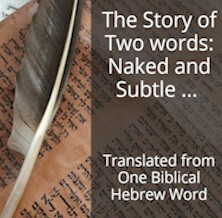 In Hebrew just one word is used, where is the emphasis, on the dry or the land? KJV – dry (ground, land). KJV – be ashamed, clean, be confounded, (make) dry (up), (do) shame(-fully), ⨯ utterly, wither (away). Clearly, the emphasis is on the dry, in fact, in Hebrew, there is no word in this context for land. It simply says ‘…and let the dry be seen.’ The Hebrew word, יָבֵשׁ yâbêsh, as you can see from other verses, is rather a desolate picture: ‘My heart is smitten, and withered (3001) like grass…’ Ps 102:4. Were they ashamed (3001) when they had committed abomination?… Jer 6:15. The daughter of Egypt shall be confounded (3001)… Jer 46:24. Yabesh applied to rocks, stones, gravel, pebbles, sand, silt, clay and dust is simply referring to their short-lived, temporary nature. We look at a mountain like Everest and if anything reminds us of solidity and permanence that would be it, but precise measurements show that mountains can lose a few centimeters, or more, each year due to the wearing down of erosion. In this verse, land is referred to as dry rather than wet because God didn’t want humanity walking in mud, land also absorbs water. This is a fundamental need for placing humanity on this planet. Dry also to tell us that the land is temporary and subject to withering. Man is in an environment that is shriveling up and fading away. What I’m writing here should not be a surprise to you, the laws of Thermodynamics say the same thing: Everything inanimate tends towards a state of decay. My description of dry land as ‘rocks…’ was rather limited, it also includes minerals like boron, chlorine, cobalt, copper, iron, manganese, magnesium, molybdenum, sulfur, zinc as well as all the radioactive substances like uranium and plutonium which are obvious illustrations of this decay. As I pointed out in Inventory of the Universe, land with its strata encloses a vast array or mineral riches from sandstone to marble from Erbium, essential for optical fibers, to Lithium fundamental for most widespread hybrid car batteries and treating maniaco-depressive troubles today. Both rich and scarce, certainly not endless. Think about the fact that all these minerals and trace minerals are needed for the sustenance of humanity-for both industry and health. The Hebrew word land is a practical reminder to literally come down to earth, the firmness under our feet. The ideal habitat for humankind. But it doesn’t stop there. Day 3 is a transitional day in that it shows the relationship of the inanimate dry land to the animate flora and bonds them inexorably together. This day does a 180° flip-flop and propels us into a ground-breaking realm. Earth’s landscape is not limited to the stark and sterile: to rocks, clay and minerals we must add earth, soil, topsoil, loam the fertility that permits grass, flowers, crops, and trees. If I was to compartmentalize the days of creation I would’ve probably completed the INanimate land and followed with the animate the next day, but this is not the case during Creation. I can only surmise why they are brought together. Juxtaposing dry land and green grass makes me think of abiogenesis and spontaneous generation. That larvae spontaneously appeared on rotten meat or microbes on broth proved life generated itself from the inanimate, so was the belief in the late 18th century. Experiments revealed that this was caused by living organisms in the air and when air was removed from the equation no life appeared. Pasteur finally debunked this proposing that all life is from life, the theory of biogenesis. Not one blade of grass, one seed of corn, one fruit has ever come from INanimate minerals, chemicals or rocks. The flora was not generated by the mineral. It was created and, as verse 11 indicates yielded seed and had seed within itself. This answers the question, which came first, the plant or the seed! Yes, I realize we’ve jumped into some deep water, and maybe I’ve lost some readers here, but we really need faith to believe this. On the other hand, no scientist has ever shown how minerals generate life so you need faith for that one too! This association of land and land cover also bears heavily on basic principles dealing with fertility, fallowness, and land Sabbath. Land rest does not mean idle bare land, we discussed the vital role of earthworms which includes their need for organic intake. This takes the form of nitrogen-rich leguminous greenery plowed back into the earth. How can we expect the earth to feed us… if we never feed the earth? This whole cycle, depicted by the coupling of dry land and living greenery gives animals and ultimately mankind the real natural nutrition it should be getting which leads to healthier bodies and minds all around. This interwoven couple, inanimate land and animate plants, animals, and humans reveal inter-dependency. We, humans, come directly from it as we shall see, live on it in the all-encompassing sense that we draw our livelihoods from it. Everything we eat, manufacture, play with and count on comes from this limited commodity of dry land, its precious contents, and cover which we tend to treat like dirt. Humanity has forgotten its roots of which Genesis 1 should remind us. Since you read all the way to here… you liked it. Please use the Social Network links just below to share this excerpt of Inventory of the Universe, Dry Land, Seas, and Flora. Why this Combination on Day 3 of Creation?